It was Adrienne who first noticed and was attracted towards the alpacas in 1990, when they caught her eye at an exhibition in South Australia. 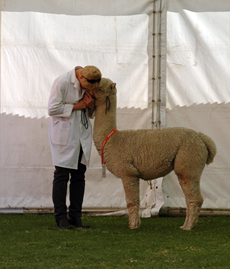 At this time, there were very few alpacas in Australia, and the industry was in its infancy. She takes credit for the inception of the Ambersun herd. This love affair with the alpacas has carried through to present day, with most of the day-to-day care of the animals remaining Adrienne's responsibility. Her most rewarding involvement with the alpacas is birthing and post-natal care. She frequently hand-rears young alpacas, and during this process, has formed an affectionate bond with many alpacas in the Ambersun herd. 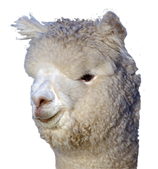 Adrienne also manages the administration of the business side of Ambersun Alpacas, including animal record keeping, registrations and transfers, book-keeping and daily office management. She works with Chris in the marketing and promotion of Ambersun Alpacas. Her research and marketing skills were established through her academic background, achieving Bachelor of Arts and Honours in Psychology at the University of Adelaide. She initially followed academic vocations in line with her education, working in health and psychology for several years before a significant career change, joining the Metropolitan Fire Service as South Australia's first female professional firefighter in 1987. At this point in time, there were only 6 female firefighters around Australia. She is well accustomed to being a pioneer in business and industry. Live as if you'll die tomorrow"
She believes with conviction that the alpacas are therapeutic in helping her to cope with the demands of a particularly hectic life. One thing that Chris and Adrienne certainly share in common is their drive to succeed and be the best in their field. Both Chris and Adrienne have excelled in high profile sporting fields. Chris is an accomplished sportsman, having been selected as representative for South Australia on nine occasions in Australia Rules Football, and winning the coveted Mail Medal twice for Best Player in the South Australia's Southern Football League. For Adrienne, her greatest sporting achievements were winning the Gold Medal in the Open Women's section of the Ultimate Firefighter at the 2007 World Police and Fire Games and winning the women's professional sprint event at the Bay Sheffield in 1988. 2. Winning the "Wool and ther Fibre Achievement Award" in the Premier's Food and Fibre Awards in 2000, for leadership in fibre development in the alpaca industry.